School blues: Marchand was admitted to the Paris Opéra Ballet School at 13. He spent four difficult years there before joining POB in 2011. "I didn't like the atmosphere or the rigid structure very much," he says. "We were given a lot in terms of comfort and training, but I thought it lacked humanity." Go-to understudy: Benjamin Millepied noticed Marchand's potential as soon as he became POB's director, in 2014, and cast him as an understudy for leading roles. He made a string of impressive last-minute debuts in The Nutcracker, La Bayadère and Theme and Variations. "I barely had my own corps spot, and all of a sudden I had to be a principal," Marchand says. "Benjamin liked to throw us into the deep end, even if it wasn't perfect, and I got stronger with every opportunity." "Hugo demands a lot of himself. He sets an example for the company." Guiding hands: Experienced POB ballerinas, from Dorothée Gilbert to Marie-Agnès Gillot to Laura Hecquet, took the tall corps dancer—he's nearly 6' 3"—under their wing early on. "It was scary at first," Marchand says, "because I grew up admiring them, but they taught me so much." 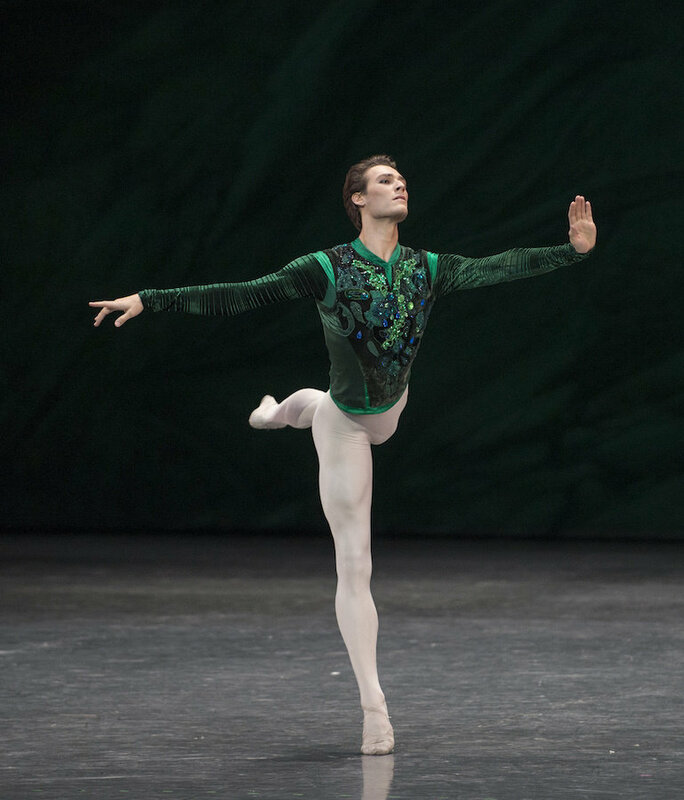 Marchand in Balanchine's "Emeralds." Photo by Julien Benhamou, Courtesy Paris Opéra Ballet. Made in Japan: Marchand was promoted every year under Millepied, and Aurélie Dupont followed suit. After another unplanned debut, as James in La Sylphide, Marchand was appointed étoile on a tour of Japan in March 2017. "I was so emotional, but it was a little lonely: You're promoted and then you go back to your hotel room," he admits with a laugh. Je ne sais quoi: From Nureyev's Romeo to works by Balanchine, Millepied or William Forsythe, Marchand has shown precocious allure in a wide range of roles. Dupont predicts a long career for him: "With every role he progresses artistically, sometimes doubts himself too—and doubt is good for an artist."